I recently completed arguably the most interesting journey I ever embarked upon. I spent the first week of June in New Orleans, as a volunteer for CulinaryCorps, a non-profit organization, founded by FCI alumna Christine Carroll, committed to rebuilding New Orleans and its food culture, through cooking and community-related volunteer work. Although I had spoken with Christine numerous times about the organization, I wasn’t exactly sure what to expect when I signed up for CulinaryCorp’s second of many week-long trips to The Big Easy. It turns out that no matter how well I may have prepared myself, I was in for a surprise. This wound up being one of, if not the most, challenging, emotional, exhausting but most rewarding experiences I have ever had (family experiences aside, of course). after Hurricane Katrina and they have been donating dorm space to volunteer groups from around the country ever since). For most of us, dorm life was long since forgotten. The check-in process gave us our first glimpse of the “X” that we would become very familiar with throughout our trip, the image of which will remain forever embossed on my brain. 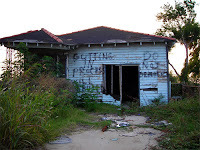 The “X” I refer to is spray painted on every house and every building in any area affected by the storm (nobody in Louisiana refers to Katrina or Hurricane Katrina – it’s just “the storm”). The top of the X indicates the date that the home or building was inspected by relief workers; the left indicated the origin of the relief crew (there were crews from many states, Canada and others); the right indicated any hazards within the building (toxic flood water [TFW], loose wiring, etc. ); the bottom counted the number of dead bodies found inside, human or animal. We were shocked by the first X we saw and the explanation received. It quickly became commonplace – we would see X’s all week – many, but definitely not all, with zeros on the bottom. Once checked-in and unpacked, we gathered in the dorm’s common room and got to know each other a little. The mood was upbeat and cheerful. We were joined by Ashley Graham, the key New Orleans representative for Share our Strength. Ashley become involved in the relief effort almost immediately following the storm and after roughly 20 trips in the first year thereafter relocated from DC to New Orleans. Ashley was about to open our eyes to the real reason why we had made this journey. We loaded into our rental vans and headed out for the lower ninth ward, one of the most significantly impacted areas in the city. Along the way, we made a quick pit stop at Dookie Chase, Leah Chase’s famous ninth ward restaurant that has served an endless list of celebrities, athletes and politicians since she took over in the early fifties. Mrs. Chase was a few weeks from reopening her restaurant and she had plenty of stories for us. Stories about the storm, about segregation, about “regulars” like Ed Bradley, about beating the odds, and most importantly about the city she loved and its people. She’s a role model if I’ve ever met one and an inspiration to female, African American, and all other chefs alike. I couldn’t help but notice the spray paint on the side of the housing complex across the street from Dookie Chase that said “dog food drop here.” With no stores or restaurants open, the people and pets of much of New Orleans were (and in some areas still are) reliant on the support of relief workers and fellow Americans. Nowhere was that more apparent than deep in the lower ninth ward, just over the river, ever so close to the levees. glimmer of hope in these neighborhoods – arguably 10 for-sale signs for every home that had any indication of rebuilding. That indication was most often in the form of spray paint on the house to the affect of “DO NOT DEMOLISH – WILL REBUILD”. Our “tour” ended with some rib-sticking poboys and beer at Jazzy PoBoys, a local favorite in the lower ninth, struggling to maintain enough business to stay alive. Poboys of roast beef debris, sausage, oysters and shrimp reminded us that our mission was to be engaged in the rebuilding and fortification of New Orleans’ vital food culture. And so our work began, bright and early Saturday morning. Our first project was to cook brunch for roughly sixty residents at Holy Angels Convent, in the upper ninth ward. Holy Angels had recently started hosting a farmer’s market on their property every Saturday and our coinciding brunch would promote awareness and bring in some customers. The kitchen and seating area had been damaged by the storm and had not been used since. Although none of the kitchen appliances were operational, we were armed with butane burners, electric skillets, and coolers. Brunch was a smashing success – we served 125 residents, stretching the food to make it seem like we expected that many all along. The farmers had more customers than ever and Holy Angels has decided that this should become a monthly event, executed by different groups. The setup at Holy Angels was make-shift, at best, but nothing would compare to where we would spend Sunday and Monday: The Goin’ Home Café in the lower ninth. The Goin’ Home Café was a community center run by Emergency Communities that provides three meals a day, laundry, internet, and children’s programs to locals and volunteers – all free of charge. The EC volunteers were delighted by our arrival as it meant two things for them: a couple days off (which were the first for many of the volunteers who had been there for months), and the promise of really good food. I whole-heartedly salute the EC volunteers for their efforts and dedication, but I was shocked to see the conditions in which they operated. The kitchen and dish pit were built outdoors (as was the only “shower”) and had plywood roofs and walls. Refrigeration and dry storage consisted of two separate semi trailers. The refrigerator/freezer trailer was broken for most our two-day stay and clearly had many issues prior to our arrival. Under ordinary conditions, our task would have been simple – cook breakfast lunch and dinner for roughly 300 people at each meal. We accomplished our task, but spent more time cleaning than cooking and threw away far more food than what we cooked and served. We served hundreds of people at each meal – and served them well. They loved the food and didn’t want to see us “chefs” leave. But this is not the memory I have of this place. I remember many things before I remember the meals: the rotten chicken we threw away from the broken freezer (roughly 2000 lbs. of it), the dish pit that consumed me, the swarms of flies – the overall disaster that was this food service operation. The volunteers are not chefs – they are saints, in every way, but they are not chefs. They do not have food sanitation certifications or culinary school degrees. They do what they can with the donations they receive (huge donations that quickly perish when the refrigeration fails), but they too are in need of help. The Goin’ Home Café was a perfect example of why food rescue programs often fail, even though Emergency Communities is typically seen as a success. My deepest memory of this entire trip was represented most by a single element during our two days at Goin’ Home Café: the people. Although very few have returned, those that have are incredible people – strong and determined. I think about Darrin, a local resident who helps out at Goin’ Home Café (he volunteered there when it was a community center before the storm) and is currently rebuilding a house for a friend. He lives in a FEMA trailer with his uncle and hopes to rebuild his own apartment. Darrin took us for a tour of his neighborhood. He showed us the house he was rebuilding and the second floor apartment where he used to live. The water line was up to the top of the steps to the second floor – for four days he looked out his window and watched bodies and other debris float by until he was rescued by a boat. Darrin didn’t ask for help; he wasn’t looking for sympathy. He had a job to do and was kind enough to take time away from it to show us around and tell us his story. We looked, listened, and will never forget. As Chef Frank Brigtsen told us later in the trip, "More than government support, more than money, we need Americans to see us and meet us and hear our story." We left the Goin’ Home Café Monday night with three full days ahead of us. None could compare to what we had just accomplished, but there was still rewarding work to be done. We spent Tuesday first at the Crescent City Farmers Market (the biggest and most populated farmers market in the city) before offering our services at to the New Orleans branch of Edible Schoolyard (originally created by Alice Waters in Berkeley, CA). Wednesday was our “day off” so off to Mississippi we went to check out an oyster packing facility (apparently one of, if not the largest in the US). Oysters were being imported from other states, due to the devastating impact the storm had on the Mississippi oyster industry. After a brief tour of the packing facility, we boarded an oyster boat operated by the Mississippi Department of Marine Services, responsible for post-Katrina oyster recovery. The prognosis is good, as many new oysters have started to develop on the millions of empty shells spread upon the bottom of the ocean by the recovery group, but it will be many years before the level of growth even compares to what it was prior to the storm. Our final working day was Thursday and we spent it back in New Orleans at Café Reconcile. Café Reconcile teaches at-risk teens cooking and front-of-house skills in a working restaurant environment. The restaurant is incredibly popular for the local lunch crowd and the students run the show – in the kitchen and in the dining room. We were to execute a very busy lunch service from start to finish, including all prep, with help from the students. The small handful of students gave 14 culinary professionals a lesson in real down-home cooking. Then, after a busy lunch rush and plenty of scrambling on our part, it was our turn to teach them. The topics of the day were job searching skills and a tasting and discussion of gourmet ingredients that the students were not likely to be familiar with. Caviar, truffles, fois gras, and different salts seemed about as foreign to these students as their lives were to anyone in our group. We may not have been well received by all of the students, but I think we connected with some, and that was worth our efforts. For more information on how you can help, contact Erik Murnighan or visit www.culinarycorps.org.